To obtain the best performance from King unit heaters use this chart for proper heater selection. To determine which type of unit is best note the ceiling height and room size. In addition to the air throw capabilities of each type of unit heater, wall and ceiling insulation must be considered when determining wattage requirements. The most common error of unit heater selection is installing a unit designed for low ceiling application on a high ceiling. In this application heat is unable to circulate properly to the floor – the result: unsatisfactory comfort or performance level. 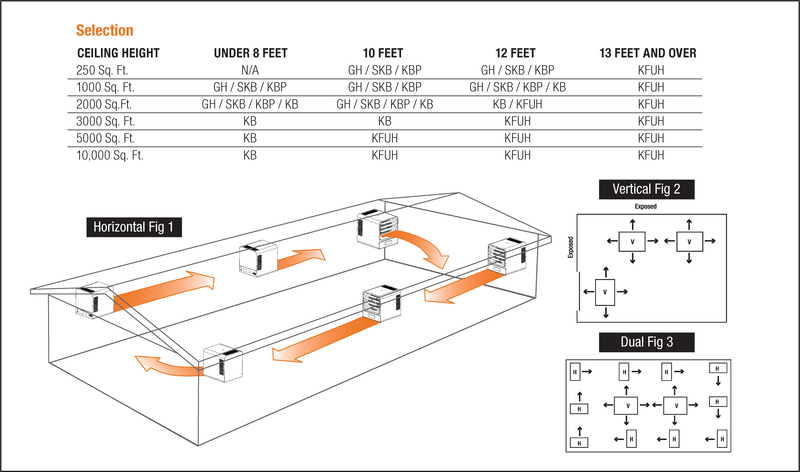 Following this guide allows correct unit heater selection for the determined space and environment. With correct selection and placement this King unit heater will provide years of high performance heating. First, calculate heating loads in the conventional way using the N.E.M.A. handbook or ASHRAE guide. Next, determine quantity and size of heaters to be used. In instances where large groups of people are normally settled in the same location use a large number of smaller kW heaters (Example: people on a production line or skilled machine operations). By utilizing heaters in this manner one can best distribute uniform heat, prevent hot drafts, reduce potential noise levels and balance the electrical operating demand. When considering warehouse areas or storage rooms where heat distribution and constant temperatures are less important, use fewer heaters of higher capacity. To maintain uniform heat and reduce stratified air it is recommended that the total CFM of the units turn the air over approximately 3 times per hour. Where square footage is large and comfort essential, both horizontal and vertical installations may best serve your requirements.